To grow your career, you know what you need to do: improve your public speaking skills. Public speaking provides the visibility and professional credibility that helps you score the next big opportunity. But even more important is the fact that it transforms the way you communicate. Improved confidence and the ability to convey messages clearly will impact your relationships with your managers, coworkers, customers, industry peers, and even potential new hires. 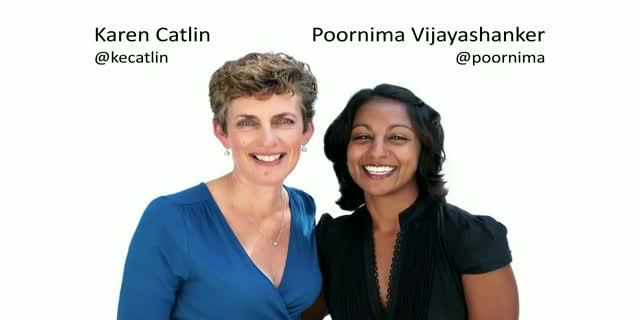 In this one-hour presentation, Poornima Vijayashanker and Karen Catlin will cover the importance of speaking at conferences and events, along with strategies to get started. They'll share some favorite tips from their book "Present! A Techie's Guide to Public Speaking," along with some embarrassing stories that are just too good to keep to themselves.